The University of New Hampshire at Manchester is expanding its workforce development efforts in bioengineering with the launch of the new Millyard Scholars program, which provides scholarships and research opportunities to high-achieving students interested in the field of biotechnology, starting fall 2019. UNH Manchester is located nearby the Advanced Regenerative Manufacturing Institute (ARMI) and its BioFabUSA program. As ARMI's workforce development partner, the university created the Millyard Scholars program to support efforts to attract and retain exceptional students in the emerging field. The biofabrication industry combines biology-related research, computer science, materials science and engineering to create an industry for engineered tissue manufacturing, which will restore form, function and appearance to wounded soldiers and reduce the waiting time for organ transplant patients. In June, Governor Chris Sununu signed into law a bipartisan bill that forgives student loan debt for college graduates who work at a regenerative manufacturing organization in New Hampshire for a minimum of five years. 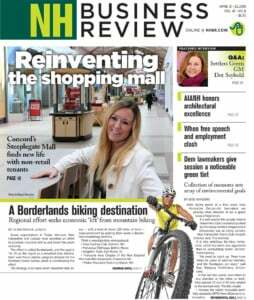 The bill also put into effect a 10-year tax exemption for New Hampshire organizations that have at least 75 percent of their business activities in regenerative manufacturing.